Luggers Cottage01263 715779work01603 870304fax Self-cateringThis fantastic cottage dates from the late 18th century having historically comprised part of a public house. Lovingly converted, it now provides warm and welcoming accommodation for holiday makers who wish to experience the Norfolk countryside. Featuring modern utilities, cosy furniture and a charming character, this property acts as an excellent base to retreat to after a long day out enjoying the attractions of Norfolk. 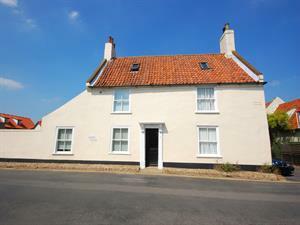 Luggers Cottage is a period property dating from 1790, and is only a few minutes walk from Wells Quay. This fantastic cottage dates from the late 18th century having historically comprised part of a public house. Lovingly converted, it now provides warm and welcoming accommodation for holiday makers who wish to experience the Norfolk countryside. Featuring modern utilities, cosy furniture and a charming character, this property acts as an excellent base to retreat to after a long day out enjoying the attractions of Norfolk. In Wells-next-the-Sea head towards Holkham, turning right at village sign and then immediately left into Park Road. Follow road round and holiday home is on left. From King's Lynn - 30 miles Bus or taxi.